WARNING: This is my longest post yet. But it’s worth the read (I think). 1) People will challenge you because they see something (good) in you that you don’t see in yourself. This will probably come as a shock to my family, but I seem to have leadership qualities that are so apparent to strangers and acquaintances. Just recently, a lady I met at Afrodigital’s Google for Business Boot Camp said that I looked like I could be a good leader for the youth group at church (she realised I was Catholic, asked me about my parish, asked why I didn’t go to the one closer to my house. You know, if you’re Catholic and you meet another Catholic, you engage in Catholic small talk, but more on that another day). She had just spent two days with me, and that’s what she saw. That’s kind of how I got to apply to be the primary organizer of a WordCamp. I asked in the Harare WordPress Meetup WhatsApp group when the next WordCamp would be, and the answer I got made my heart sink. There was no organizer, therefore, there would be no WordCamp. My boss, who’s in the same group, later suggested in a private conversation that I should apply to do it. I could write an entire post on why I thought that was a bad idea, but it all boils down to feelings of inadequacy and leadership insecurities. The Harare WordPress community is dominated by developers and programmers, and if we’re being honest, bloggers are a little (unintentionally) side-lined from the conversation. I was afraid that I wouldn’t be able to give these people the experience they had come to enjoy from past WordCamps. Not to mention the fact that I’d only just joined the community, I wasn’t even a year in (my first encounter with the community was at WordCamp Harare 2017). However, my boss didn’t seem to think so. He said I could do a great job at it. I don’t know when I became such a curious person, but I wanted to see if he was right, so I took up the challenge. 2) If you look closely, you’ll realise your frustrations are a result of you projecting your fears onto other people. 3) People are willing to help, just ask. Ask anybody who uses WordPress, and they will tell you that the community is what makes WordPress the best CMS out there. Everyone is rooting for everyone to win. Where people can help, they will help. No questions asked. It took a while for me to learn this, coming from a country where things are so tight and everyone is just trying to survive (putting food on the table is usually the end goal, not making millions). While we (Zimbabweans) have amazing qualities (we’re charming, friendly, hardworking, brilliant, and yes, that’s facts! ), we just don’t have a culture of volunteering. We want to know “zvine mari mukati here” (a phrase used to mean “am I/are you getting paid?”). If there’s no monetary gain, there’s hardly any point in doing it. So when I volunteered to do this WordCamp organizing thing, I was afraid to ask for help because “ndini ndakazvikanyira ndega”**. But boy oh boy, was I wrong. I got help from all over the world. Literally. Rima Trew, our contact from Hellenic Academy, was so gracious throughout the entire process. Hellenic sponsored more than just the venue, they gave us clean borehole water so we wouldn’t have to buy expensive bottled water. They took care of all our A/V requirements (shout out to Fisher!). The rooms were great. Everything was just perfect. And at NO COST! ZOL Zimbabwe sponsored our internet. Last year, Caspar (our German, honorary member of WP Harare meetup) bragged and called this the best internet he’d ever had at a WordCamp (and, coming from someone who’s been to WordCamps all over the world, that’s saying something). I must give a shout out to Ranga from ZOL. She was so amazing from the beginning to the end. I felt like I was talking to a friend, not to an aloof corporate person. The whole ZOL team was gracious too. Caspar helped out with our Camptix plugin. PayNow was also very gracious in working with our team to get it done. WordCamp was going to be a nightmare if we couldn’t accept local payments. (There’s a whole lot of confusion in Zim’s financial situation, but basically, online payments are not easy here because our credit cards don’t work etc etc. Yey bond notes). Aleks was an incredible mentor, and Hugh was an outstanding deputy. I could literally text these two anytime and they would help me. The mindboggling thing is, they don’t get paid to help out. My entire organizing team was phenomenal! Somehow, Nigel made our budget work even when it looked like we were going to be in debt. Achim did a great job with the speakers, Thelma was amazing with the kids, Peter and Jules had the catering situation on lock. Alwyn had us swagged up in cool t-shirts (as always), and Joshua gave us some good photographs for the event. I can’t believe I was even worried about anything. Our Global Sponsors also came through with awesome swag (it ran out fast!). 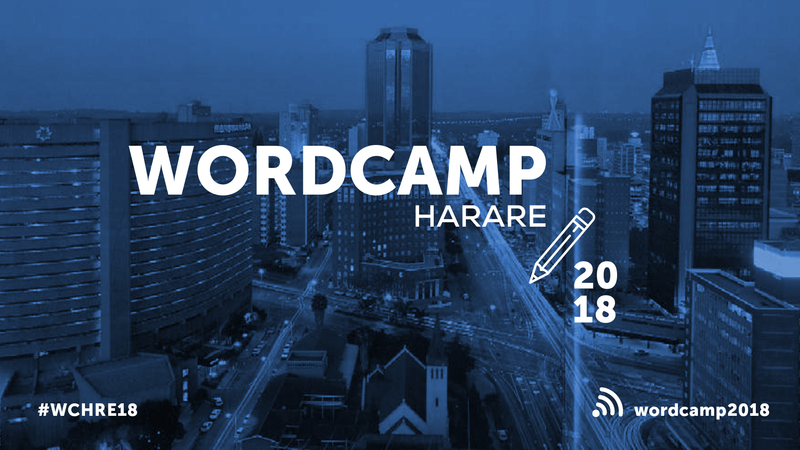 We wouldn’t be able to have WordCamp Harare without the help of Jetpack, WooCommerce, GoDaddy and Bluehost. Marketresearch.biz (research company based in India and the US) also came through with bronze sponsorship just in time! How they came to know of us and even to help is beyond me, but I’m absolutely grateful. Other MVPs include Petya (she showed us how the Juniors’ Workshop should be done), Mary Job (she helped sign up some kids when we had a glitch during the Juniors’ workshop), William D Jackson (microsponsor and a true hero. Seriously, nobody is more enthusiastic about teaching African children about technology than this guy) and our very own Thabo Tswana (he’ll say he didn’t do anything, but he’s the reason we even have a Harare WP community). The speakers were phenomenal (Beaton had another event going on the same day, but he still managed to come and speak. Talk about commitment!). PS: I must thank my family for being so supportive. They don’t understand half the things I do, but nobody on this planet cheers me on louder than my band of awesome sisters. 4) You have to be willing to give. It’s a clichè, but it’s true. Give, and you will receive. I gave my time and energy to WordPress, and I received help. support, love and a host of other good stuff (SWAG!!!). Give what you would like to receive, and you will receive it plenty-fold. Phew! I didn’t intend for this to be so long. But my experience planning WordCamp Harare 2018 taught me that the world isn’t an iceberg filled with nastiness. There are lots of good people out there. You just have to be willing to be good yourself. That’s the law of attraction, isn’t it? ** this is a song by the legendary System Tazvida. The phrase written here basically says “this is what you signed up for” in a sarcastic tone. The song is called Wakazvikanyira Wega (you messed up on your own). I’m not a translator, so don’t come after me with technical faults and what not lol. Great post! You did an awesome job, it was my first time attending and i’m pretty sure it will be one of my best! Oh I’m sure you’ll eat your words next year. The WordPress Harare community keeps elevating! Trust me, you’ll be pleasantly surprised. This is so apt. I can so relate to that ‘we are not wired to give’. People will ask you, what’s in it for me. Let’s leave that aside for now. Thumbs up for you for having an awesome camp. And thanks for the shout out. You are so welcome. I’m inspired to read that and I’m happy to serve 🥰. Number 2 is sooo real and i actuallyhadn’t seen it that way. Thanks! I’m just happy to see you do the things that make the things to be done. You are on the right path my G! Wonderful ,you made the community proud.